If you are a blogger, you already know that there are different opportunities for the monetization of your blog. One of those is blog sponsorship. Even if you are not taking advantage of any monetization efforts, you are likely aware that they exist. If you were to research the topic of blog monetization, you are likely to find blog sponsorship on that list. Granted, it is probably not the first on the list. I mean, it isn’t like everyone who starts a blog has some sort of goal of monetization, let alone the specific one of blog sponsorship. There are different reasons why people choose to become bloggers. Some fall into it accidentally. The blogger label happens as if by accident after they have been writing for awhile. Others were writing even before the word, “blog,” was created. Yes, there is a time when blogs were not the central focal point of the internet! Then, there is another group of people who chose the blogging lifestyle for what blogging had to offer them. And, among those reasons, we can find some diversity (differences). How about these reasons. Do you see yourself in any of these? The sheer joy or fun of it all! While “monetization” is not on the above list, there are those who may choose that blogging lifestyle for that reason. Though, generally speaking, from the conversations I have had with other writers, that usually is somewhere in the afterthought category and a part of asking oneself who to pay all those fees (i.e. domain, hosting, etc.) to keep one’s blog going! Skyrocket Blog Pageviews Using Google Analytics by LearntoBlog is a program that teaches you how to SkyRocket Your Blog Results even in 30 days! (Affiliate program, but I've used it and can personally recommend it!) ” and ensuring that you are getting the traffic, with another program by the same people, ” Dominate the Search Engines Using Webmaster Tools by LearntoBlog is a program that teaches you how to get better results in your search engine optimiations efforts. Yes, I am an affiliate, but like the other programs by LearntoBlog I've used it and can personally recommend it! ” (affiliate links). The definition of “blog sponsorship” is an interesting one. I can include the provision of money (which is what we are primarily addressing here), or it can even include an exchange of benefits such as advertising or promotion of your site. The idea here is that you (and your sponsor) are choosing what is most beneficial to each of you and then deciding of that agreement works for both of you. Write advertorial posts/reviews about the Sponsor’s products and post on your blog (just be sure to indicate that it is sponsored content!). Including a banner advertisement pointing to the sponsor’s products or services in exchange for a monthly advertising fee (classic advertising). Exclusive sponsorship which is a case where a sponsor pays more money to become the “Sponsored by” company in that niche. This should cost more because they are obtaining more attention than you are, with your site. Sometimes, we are actually participating in blog sponsorships and do not even realize it. Don’t let the phrase “blog sponsorship” or other phrases like “blog sponsorship opportunities” or “blog sponsorship rates” confuse you and make you think you don’t know what it is when possibly you know what it is and are already doing it! Sometimes you have questions like “How do I prepare a blog sponsorship proposal?” or “How much do blog sponsors pay?” or even “Where do I find the blog sponsorship websites?” Fortunately, we will cover that in the total of ten articles on blog sponsorship. You can also view a listing of all of the articles on blog sponsorship at once. Other topics to look forward to is a discussion of how to deal with companies that sponsor bloggers and finding that sponsorship match made in heaven. Another topic is how to get sponsored posts for your blog. We mentioned that sometimes blog sponsorship does not have anything to do with money and could be an exchange (or something similar). On example is a travel or conference sponsorship or blog sponsorship packages. I had one of these earlier this year when I was asked to speak on a topic related to education. I contacted a company that was in the online education niche to ask about sponsoring the costs of the travel to the conference. There was no conference fee because I was one of the selected speakers. So, even though there wasn’t profit, there was exposure as an SME, which is huge. And, no cost (or no major costs) because of a conference sponsorship exchange. In the cases of exchanges for this like this, ensure that you have calculated your blogger rate card (we will cover this in more detail in a future post). In other words, you should determine what your rates are, as well as your rates, so to speak, for exchanges. After you have calculated what you need, the actual terms of the agreement are handled in a case-by-case situation, using your foundational definitions to keep you focused. To give you a preview, sometimes these case-by-case terms include future sponsored blog posts, as well as social media posts while attending the event or conference. Sometimes there are opportunities to participate in things like press events, tours of brand headquarters, exclusive blogger activities, and more. Define your blogger rate card before negotiating your blog sponsorship deal. Did you know that even access to review items is considered a sponsorship opportunity? See, it isn’t just about the exclusive sponsorship opportunities. There are many sponsored blog post opportunities that exist in everyday life as a blogger! 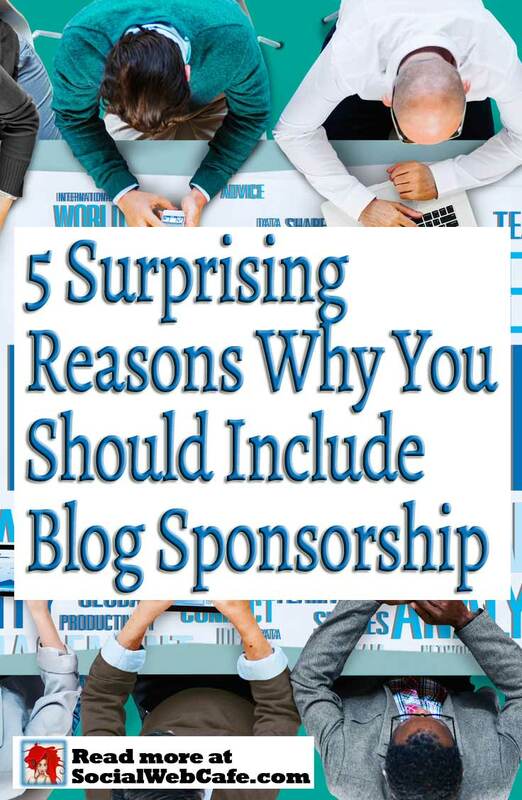 There are things to consider when it comes to blog sponsorship. providing value to your readers, in the midst of a sponsorship. Choose those sponsorships which are in agreement with your brand. If you start veering away from your brand quality, ethics, and reputation, it will seem like an advertising site, and your content will not be worth anything. If you can find quality blog sponsorship opportunities, there is at least one more aspect to consider. That is, ensure that those sponsorships are relevant to your blog niche/topic before moving forward. Blog sponsorships should be relevant to your niche to be of value. By making sure that your sponsorships are relevant (related to your niche), you are more likely to continue to satisfy your readers. This is critical. At no point is the definition of blog sponsorship the trashing of your readership. Your readers are the reason that you exist, so don’t forget to keep their needs in mind. If you can take all of these considerations and balance them out, you will eventually be able to relax and even sleep! Your success can happen while you are sleeping or watching your favorite Netflix movie. When you can correctly set this up, you may earn some income and opportunities, as well as SME distinction… Yes, while you are sleeping! Keep in mind that your brand awareness, which includes cognitively remembering your audience, results from taking action. At the same time, taking actions or not taking actions influences brand awareness. So, as an example, ensure that in your blog sponsorship excitement, that you do not have too many sidebar ads. This is distracting and can cause your readership to become disinterested. Also, communication is important. Ensure that you are representing that your blog is high quality by communicating well and often enough, with your sponsors and advertisers. You do not want to harass them, but you also want to ensure you are not ignoring them. This communication aspect includes ensuring that you understand the terms. You know your terms, but have you read the fine print of their terms? Keep in mind that you may have an organized view of the world, but not everything is always communicated well by others. So, ensure that you have asked the right questions, etc. But, fortunately, we will be talking about all of these things in our future articles on blog sponsorship. While some of those items are the above list are not necessarily surprising, there is likely a few that were not the first that you thought of, when defining blog sponsorship. Either way, it is a worthwhile list to consider (and stay tuned for more articles on the topic, here on SocialWebCafe.com!). Don’t forget that there is more to life than just the money-making (or opportunity-making) sponsorships. You also need to consider your content and the maintenance of your blog. Fortunately, we have resources available for those who need to hire a writer or get help with the technology (bias toward our own services 🙂 ). If we are a blogger, we had some sort of reasons for being here. But, regardless of that reason, at some point, we cross paths with the idea of monetization. We may be concerned that we are covering blog expenses (to keep it going), or we simply would like another income stream. Regardless of the reason, blog sponsorship is a type of monetization that deserves a little of our attention (or a lot of our attention!). So, are you ready to put some time into implementing blog sponsorship for your blog? All it takes, to start out, is taking that first step. So, let’s do it! Hmm, how do you negotiate with sponsors that want you to write about a certain topic and include their products but don’t want to actually pay you or give you a product to review? This is some great information! Going to have to read and re-read and figure out how to make some of these ideas work for me. Good tips! Thanks! This is a really good write-up of some of what people should think about when considering blog sponsorship. Learning to negotiate might take some practice but it’s a very important part of the process. You touched on some very important points here. Right now I’m finding that I want to stay as close to my brand as possible, so I’m being careful what opps I take on. Definitely always disclose! You need an honest relationship with your audience. Great post! This is a great post. I definitely second the making relationships with brands / companies / firms. That is important to do. I work with multiple companies and firms throughout the year. What I loved the most about reading this article is that it isn’t just rich but it also precise. Looking forward to reading more! Thanks. A very exciting post on blog sponsorship. A very new topic for me. Enjoyed every bit of it. Thanks, Shabir! I appreciate the feedback and glad the article was helpful, especially to where you are at right now in your blogging journey.